Strawberry fans will love this homemade strawberry poke cake! White cake made from scratch with strawberry jello combined with bits of strawberries throughout the cake, a thin layer of strawberry chunks, topped off with a layer of Cool Whip is sure a sweet delight! 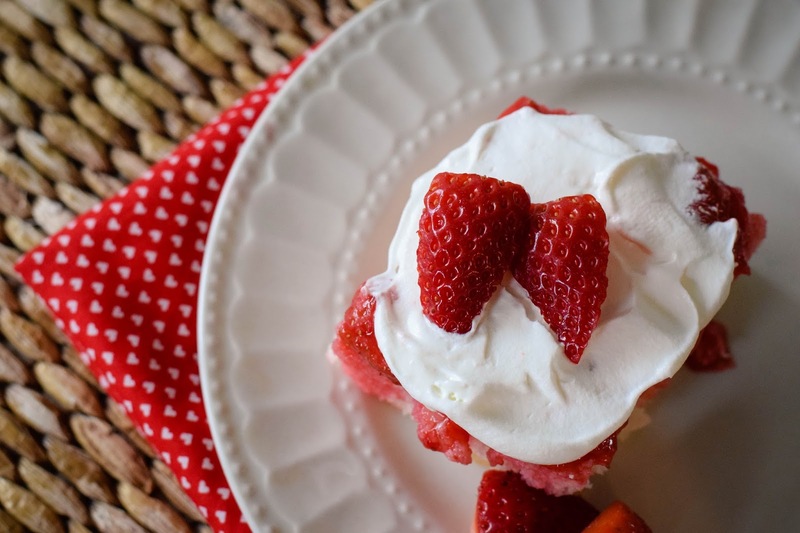 Add a final touch of sliced fresh strawberries to the top to complete this fresh dessert! Since Valentine's Day is coming up I thought it would be fun to share such a pretty cake and perfect for the holiday. 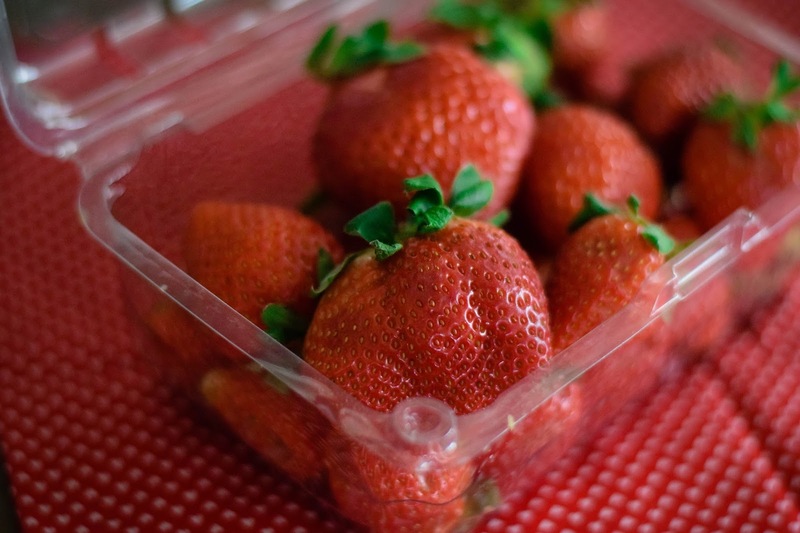 But it is also great really any time of the year, especially when fresh strawberries are in season! Strawberries are my favorite fresh fruit in the summer! 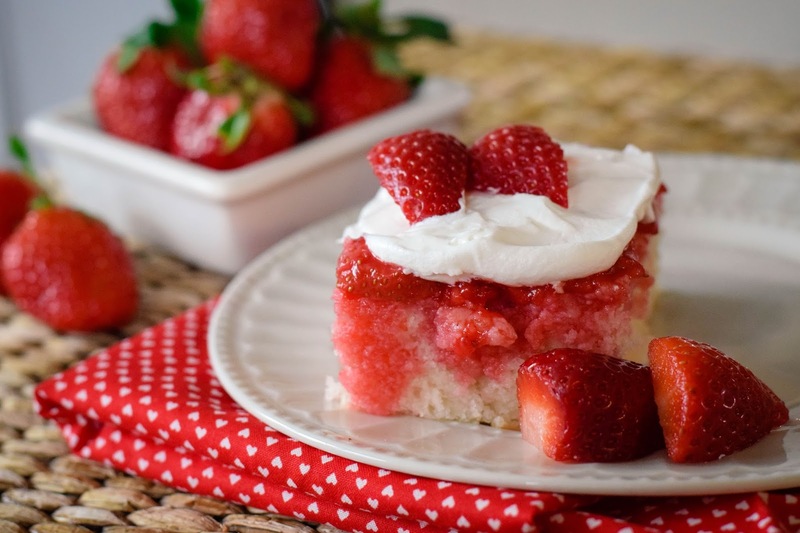 It is a great summer dessert! In a small mixing bowl combine the flour, baking powder, baking soda, and salt. Mix together and set aside. In a large mixing bowl combine the shortening, sugar, and vanilla and beat together with hand mixer until well mixed. Add egg whites to the sugar/shortening mixture and beat well. Then add the flour mixture and buttermilk a slowly and continue beating together until it is all mixed together well. Pour the batter into a 9x13 well greased baking pan and bake at 350 degrees for 30 minutes. Remove from the oven and let cool. 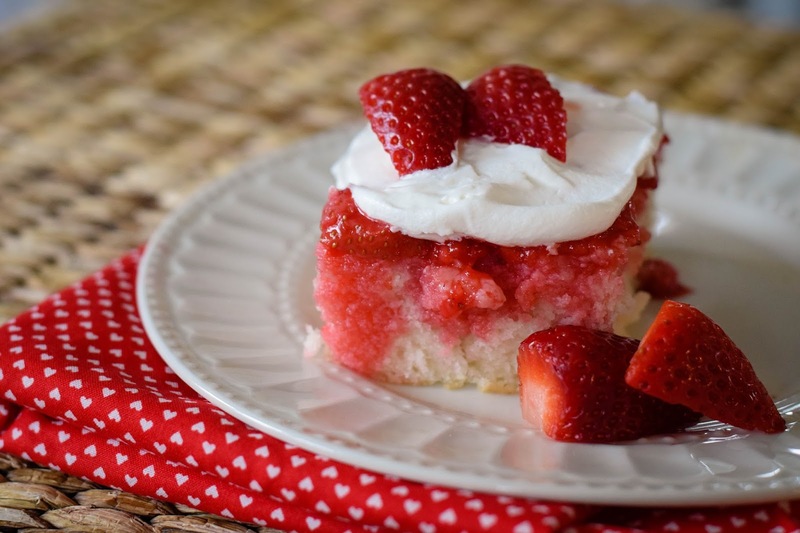 While the cake is baking and cooling, prepare the strawberry topping. Boil the water in a small saucepan. Chop and dice the strawberries into small pieces and crush them slightly. 2 cups of strawberries are needed. Add strawberry jello mix, the boiling water and the crushed strawberries to the saucepan and bring to a boil, then let cool. Once the cake is cool use the end of a wooden spoon with a round handle and poke holes into the cake. Pour the cooled strawberry jello mixture over top of the cake and into the holes. Some of the strawberries can be spread out on top of the cake as well to give a little strawberry layer on top of the vanilla cake. 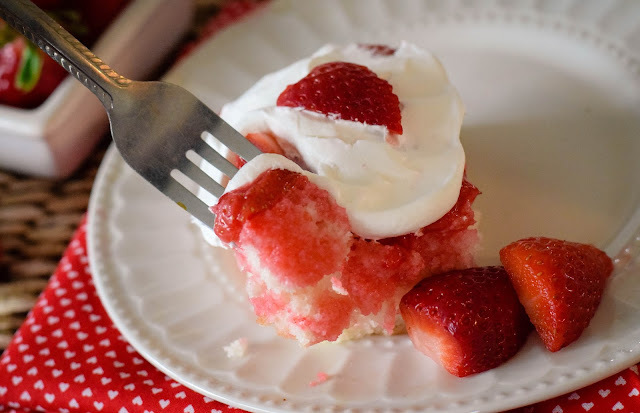 Top off the cake by spreading the Cool Whip all over the cake and add sliced strawberries on top. Keep in the refrigerator until ready to serve. This homemade cake is super delicious! Its fresh and perfectly sweet for any potluck dinner you may have. Great for Valentine's Day, Forth of July, any special occasion you may have. Especially when strawberries are in season with fresh berries! There are so many slogans in the food industry that promote buying local. I am sure you have heard some of them, at least one of them. There are so many great reasons to do all the above. - You will receive the freshest produce, meat, bread, etc. - You are buying local and supporting your local farmers, therefore keeping profits within your community. - Knowing where your food comes from. But you may be wondering how to buy from a local farmer? Supporting your local farmers by eating locally grown and bringing your food straight from the farm to the table! 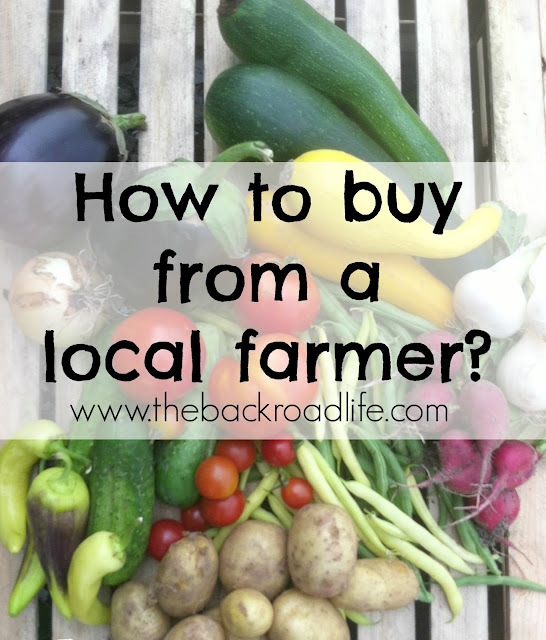 So how can you buy from local farmers? A lot of the times your hometown grocery stores or even larger grocery store chains will have locally grown produce for sale for shoppers to buy. Here in Indiana, we are able to grow a variety of produce during the peak season and local grocery stores like to provide locally grown products for their consumers to purchase. There will usually be signs on the the produce that is grown locally simply stating "Locally Grown." If you're shopping at the grocery store, be sure to purchase those locally grown fruits and vegetables when they are available. You can also seek out your local farmers markets! You may be wondering how do you find out about local farms in your area. There is a great resource website where you can find farms all over the United States! There are several ways to search on Local Harvest. Farmers can have their own farm page on the Local Harvest website so it will be listed when a customer searches. So if you are wanting to find farmers markets in your area, simply enter in your zip code in the search bar on the top of the screen. It will bring up every farm and farmers market that is in your area. Searching for specific product in your area is also an option. Through Local Harvest you are also able to search just for farmers markets, farms, and CSA programs alone. The Local Harvest website will bring up searches for anything in the United States that the farmer has registered and entered for their farm on the page. So this can help you find a farmers market or several in your area for you to shop from. 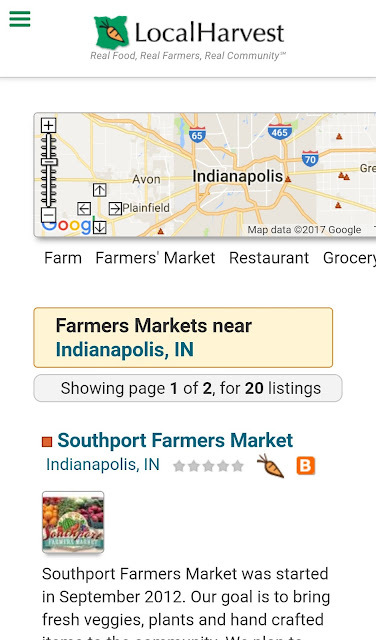 Local Harvest searches nation wide, but for this post I searched for Indianapolis with results of 20 farmers markets in the Indianapolis area. You may want to support one of a few farmers on a more regular basis by supporting their CSA program. You can read more about the benefits of CSA here and here on my blog. If you haven't read my blog before you may not know, but my husband and I grow produce and pumpkins and we offer our own CSA in our area for our customers to participate in if they wish. The Local Harvest website allows you to search just for specifically CSA programs in your area. Farms with CSA programs will appear and it can link you directly to that farm's website to read about their CSA more and possibly sign up for a subscription. CSA programs have become a popular way for consumers to buy local and its a great way to support farmers and really get to know the farmer and where your food comes from. With technology these days, consumers also have access to what is called food hubs. Food hubs are where farmers and producers to get their products easily accessible to consumers. Food hubs provide the logistics on selling, collecting, and distributing the products that the consumers purchase on their online store (food hub). 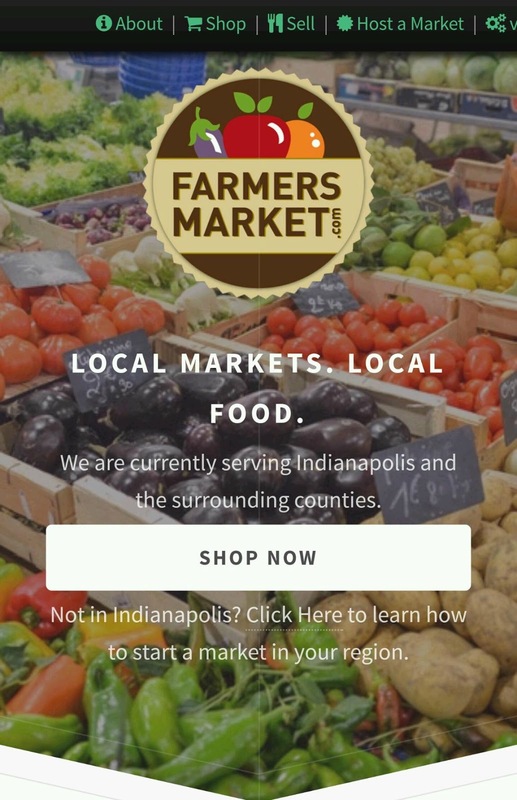 There are various food hubs all over the United States, but if you are in Indiana, specifically the Indianapolis area, a great one is FarmersMarket.com. You simply go on to their website and order from several local farms and artisans. They collect the items for your order and distribute them via delivery to your home or pick up location that you have selected. How great is that! Fresh produce, meat, bread, etc delivered right to your door as much as weekly if you would like! This is a great option for you if you don't have time to visit the local farmers market each week but still want to purchase fresh local products. If you are one that would like to shop at the farmers market, chit chat with the farmers and enjoy the atmosphere be sure to check out the Local Harvest website and search for a market near you! Here in Indiana, there is a new program available to consumers while shopping the farmers markets. 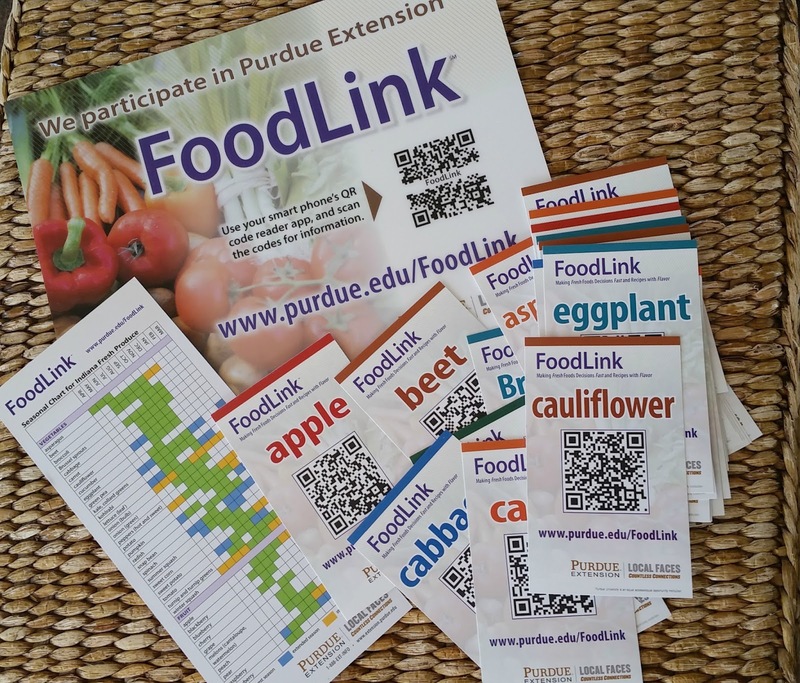 Developed by Purdue Extension, it is called Food Link. It will be a great resource for consumers to look up vegetables and fruits while shopping. The program is designed to connect consumers with useful information about their food choices with the use of their smart phones and the QR code cards displayed in the grocery store or at the farmers market. Each product has a card with a QR code on it. With the technology of our smart phones, simply scan the QR code with a QR code reader app. The program will then bring up a link from the QR code to the product. So for example I scanned the QR code for apple. Clicked on the link and am brought to a variety of information!! Preparation - with even a video of apple cutting tips!! and even food safety tips. How cool is that!! Through technology we are able to look up all that information with the simple scan of a code!! I have the QR Reader app on my phone and it even stores QR code history for you. 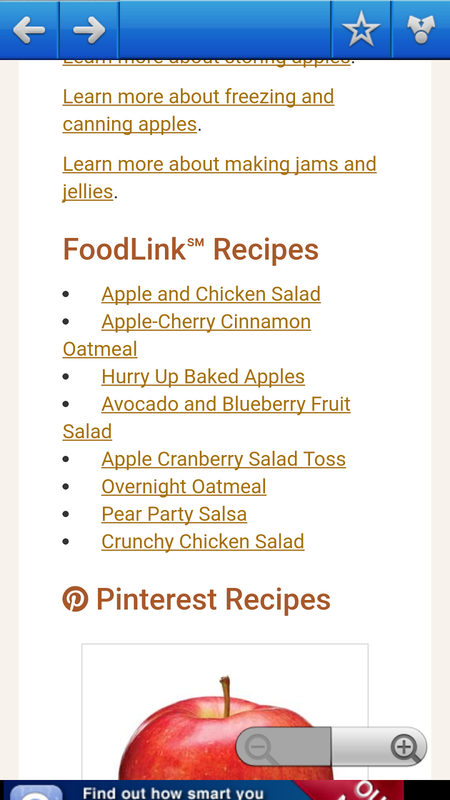 There might be other programs similar in other states, but this Food Link program really gives you a lot of information that is easily accessible at a quick glance! It is even implemented in some grocery stores around our state. If you're not in Indiana, you can still benefit from the program by visiting the Food Link Resource page. You may have seen collard greens in the grocery store before, but not know much about them. 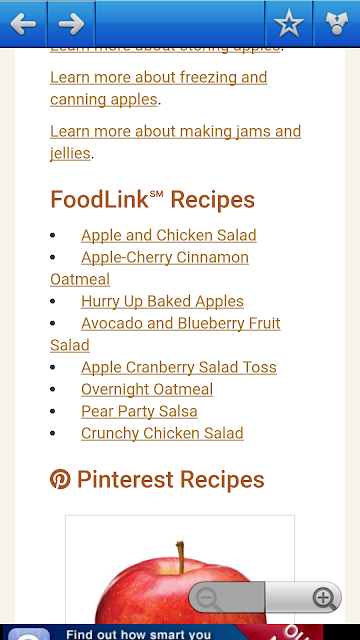 Reference the resource page and find out all the information I listed above, but of collard greens. 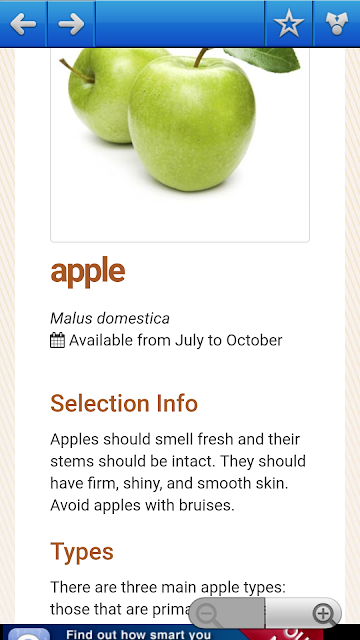 There are 61 different fruits and vegetables that have full resource pages on the website. As I have mentioned before here and if you follow my blog, my husband and I grow produce and pumpkins and are vendors in our local farmers market. We have this program and are excited to implement it in our produce stand at the market. We plan to display the cards in our stand for easy access for our customers as well as have the Food Link brochure available. With technology today all these programs really are helpful for us as growers. Consumers are looking for farms in their area and we are able to promote our farm and CSA using Local Harvest. We hope to become part of a food hub in the very near future as well. 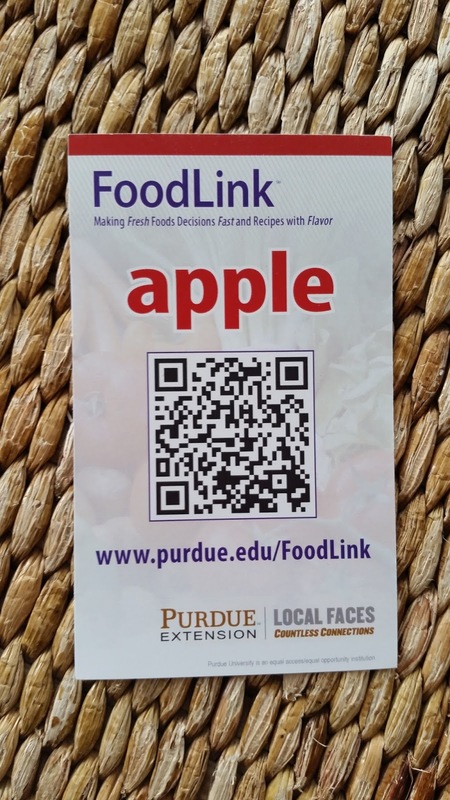 The Food Link program will be beneficial for us as we are at the farmers market. We often times get customers that haven't heard of a vegetable that we have available or maybe they have but not sure how to prepare it. Sometimes the market is busy so these produce cards will be great to help share information about specific produce, how to prepare it and recipes we can share with them as well. but thoughts and opinions are 100% my own. I love chicken pot pie! It can be a bit of work to prepare a traditional chicken pot pie, so I love this crock pot version. Packed with flavor and a little simpler to have ready for dinner time, is sometimes the way to go! 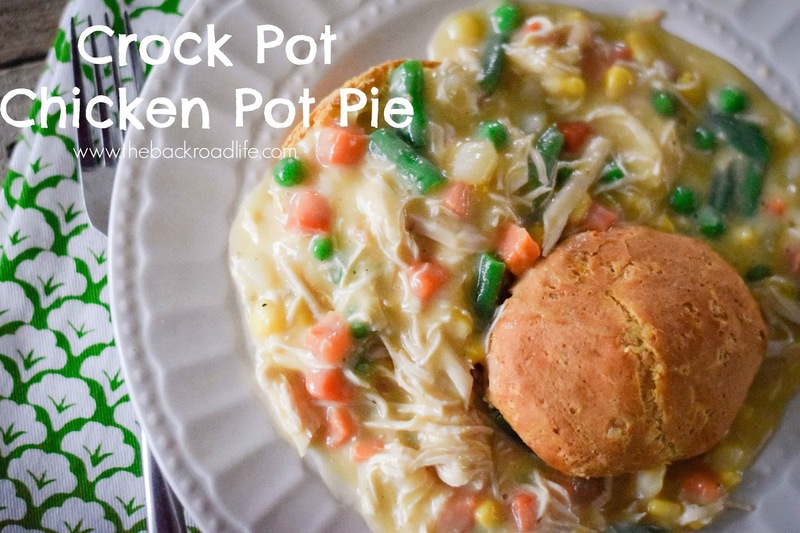 A classic and delicious comfort food meal....crock pot style. 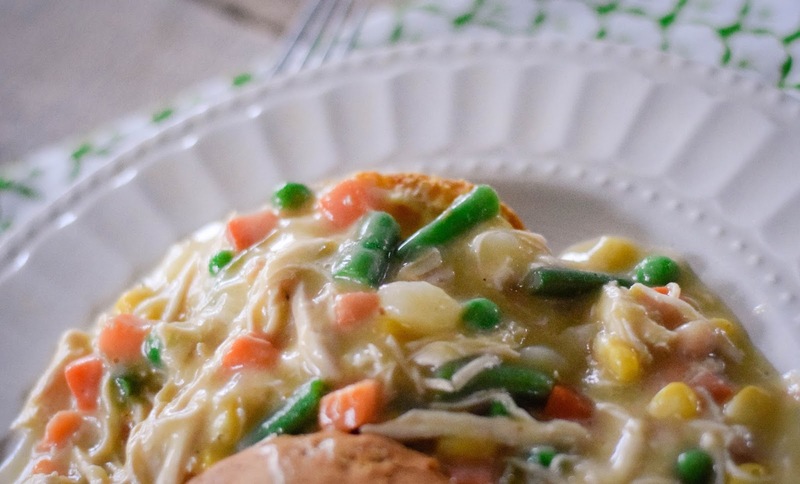 Juicy chicken breasts cooked to perfection and shredded cooked with a mixture of vegetables and a creamy sauce. Served over a biscuit cut in half. An easy and flavorful crock pot meal. Place the three frozen chicken breasts in the bottom of a 6 qt. crock pot. Add 2 cans of cream of chicken soup, salt, pepper, chopped parsley, chopped celery, diced onion, and potatoes to the crock pot and stir it all together. Cook on low for 6 hours. At the end of 6 hours, remove lid from crock pot and pull apart and shred the chicken breast simply with 2 forks. 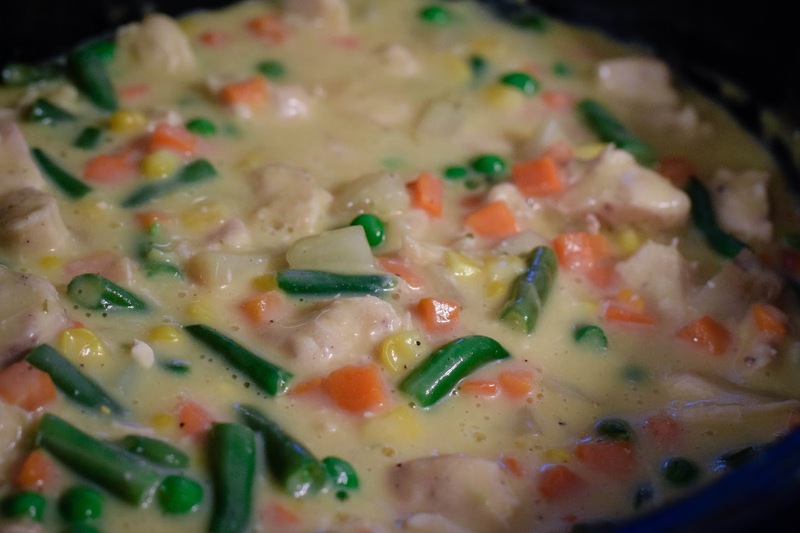 Add the bag of frozen vegetables, chicken broth, milk, and the last can of cream of chicken soup. Cook for an hour longer. While that is cooking the remainder of the way, bake the Pillsbury Grands Biscuits as directed on package. Cut biscuit in half and pour chicken pot pie mixture over top. Serve. Tasty and delicious well rounded meal for all to enjoy! 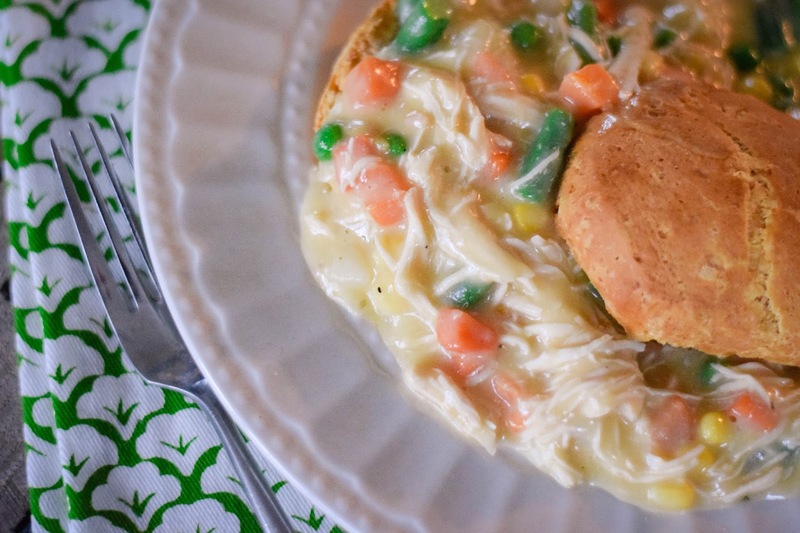 Bringing a little homestyle into a meal with the ease of using the Crock Pot. For a few years now I have participated in the Christmas In The Country blogger Christmas gift exchange. 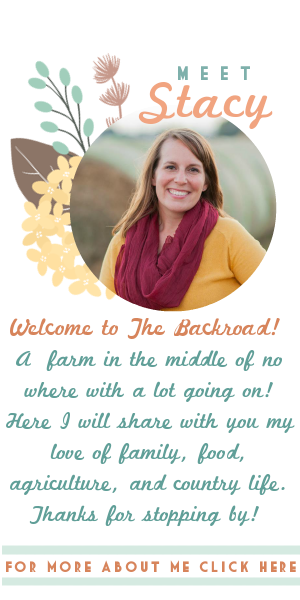 It is so fun to connect and find out about other ag bloggers and what a fun way to do it! 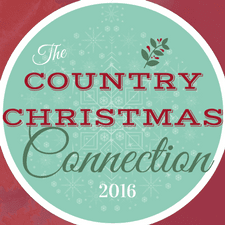 This year it has been re-named The Country Christmas Connection with new hosts, Darleen from Guernsey Dairy Mama and Jenny from The Magic Farmhouse and I definitely wanted to participate again! Thanks to them for continuing the fun! It's so exciting when the package arrives and to find out who your Secret Santa is! Mine was Lori from The Home on the Range Exchange, which was so neat because I was her Secret Santa last year! How fun!! I loved getting the package from Lori and opening it to see what she sent me. The package was stuffed full of all kinds of neat things! I love handmade and she made several of the items in the package! I love how Lori made things that went with stuff that I like and enjoy! She made a pot holder and knew that I liked sunflowers! She made notecards with some of her beautiful scenic photos she has taken as she enjoys photography. Are the photos beautiful?!! Sugar scrub was also included that she made using essential oils, and I love to use them as well. It was so sweet of her to include something for my kiddos also! The moon sand, that she also made...and they loved to play with it! In addition I really enjoyed how Lori included items that are from different things that she is involved with. The Kansas Wheat Commission cookbook, the 4-H clover cookie cutter, the sand plum jelly (which was so tasty by the way), and the sweet smiles candy! She topped it all off with a Christmas ornament to capture that I love rustic and Christmas! Lori, you did a wonderful job at putting my package together, it was so fun to go through and I enjoyed everything! My daughter has loved playing with the moon sand!! 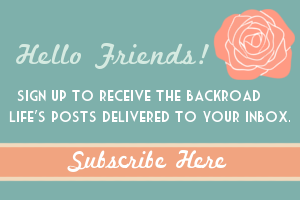 The Country Christmas Connection exchange is a great way to connect with other ag bloggers! I'm so glad I participate! To read what the others received check out the link up here. I hope everyone had a Merry Christmas and a great start to 2017!